this is chapter 2 of the Rose and thorn. 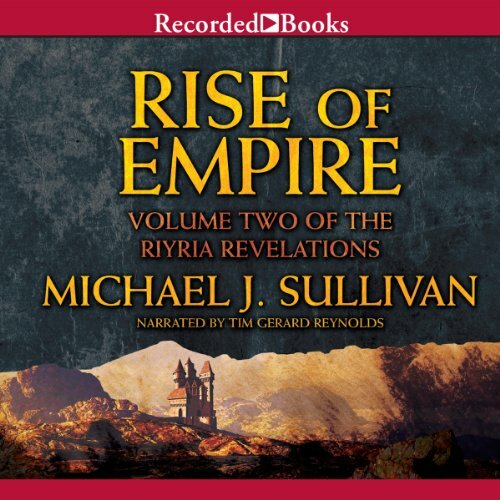 Rise of Empire contains Nyphron Rising and The Emerald Storm, books 3 and 4 of Riyria Revelations. Good story and Tim Gerrard Reynolds performance is stellar. Looking to the conclusion of the series. Great continuation of the first book. Tons of fun! 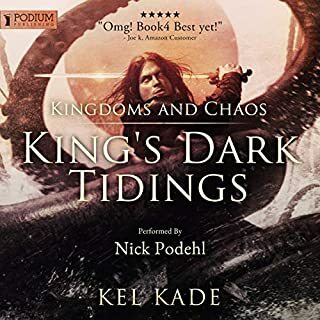 This book picks up after a year or so after the end of first book where Church has found a lost leader and started to form an Empire. Our combo of elvish assassin and burly fighter find themselves working for the king of Melengar as spies that book start to focus a lot more on the politics and intrigue. I enjoyed this portion of the book that author does not let the narrative get dull with endless chatter. Some of the characters are cunning yet funny. Scope of the story is larger, and yet book almost manage to move as fast as the previous book (though there were few moments which I thought were kind of a drag). Author provides a lot more depth to the characters of Royce and Hadrian. Back stories of Royce and Hadrian is been flushed out which is masterfully integral to the over all story. There are twists in this book which caught me by surprised. Arista's development as person and as an practitioner of the 'art' continues, and it is a fun ride. Sense of humor between two thieves is still fresh and fun. 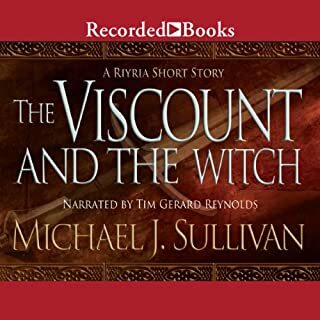 Narrator did a great job, and book is really a fun listen. This audio series is turning into one of my favorite. This book has setup nicely for the last in series for which I cant wait! 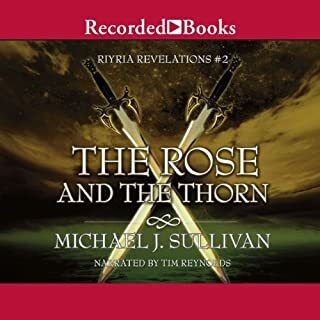 Although Volume 2 of the Ryria Revelations contains two books, Nyphron Rising and The Emerald Storm, I still felt how I usually feel after reading the middle book of a good trilogy - unsatisfied with how things are left off and ready for more. 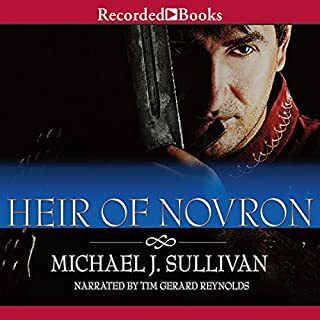 Royce and Hadrian continue their adventures and do some digging into their pasts, while Arista sets off on her own and faces some serious challenges. Each of the characters is flushed out some and the bigger picture continues to come into focus. For me, The Emerald Storm was a bit of a tangent and did not advance the main storyline as much as I would have hoped, but any story involving Royce and Hadrian is entertaining so I'm not complaining. Tim Gerard Reynolds does his normal excellent job bringing the characters to life and at this point I could not imagine anyone else voicing them. So if you enjoyed Volume 1 there is no reason to hesitate on picking this one up, just keep in mind that the story doesn't end here and you will have to pick up Volume 3 as well. This is a must read series it has everything. What was one of the most memorable moments of Rise of Empire? Which character – as performed by Tim Gerard Reynolds – was your favorite? If you could sum up Rise of Empire in three words, what would they be? 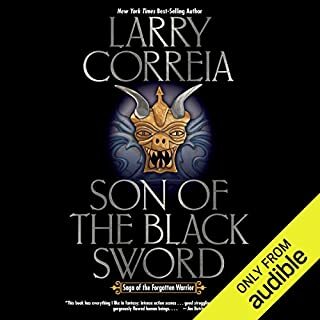 This series does get better as you develop more of a connection to the main characters. 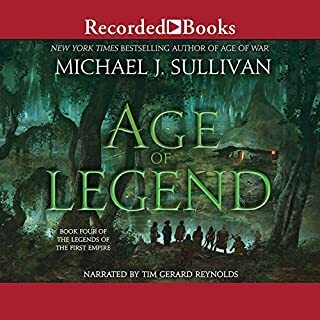 This series is definitely a worthy listen / read and most definitely should be experienced by fantasy fans. What did you love best about Rise of Empire? This is my favorite new series. It has great characters the story is fast moving and has the depth that I look for. Truly a great read. I have recommended it to all my family and friends. Royce was my favorite character because his dry humor reminded me of my father. He is a great performer. I think he really gets a great feel for the characters before he even starts his work. I don't believe that I could honestly choose. Would make a great tv show! If anyone could transition this to tv without mucking around with it to make everybody in love with everybody else, or whatever idiot changes they always seem to make when adapting somebody else's work, this series would make for fabulous television. Royce and Hadrian, the main characters, have that 'odd couple' relationship that makes for fun banter and frequent bickering. There is plenty of straight-forward action with sword fights, battles, daring escapes, rescues, robberies, etc. There are also lots of secrets and lies, betrayals and conspiracies. I hate it whenever I have to stop listening, because I'm wondering what's going to happen next. 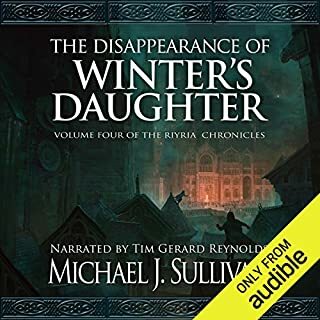 I really enjoyed the first Riyria book, as simple as it was, particularly for a few of its interesting characters, promising set-up, and what felt like competent writing. This sequel promised more of this--but suffered from a complete lack of focus (or editing). The first part's plot dragged (prepare for discussion after discussion) so that very little occurs until nearly midway, but I was willing to just listen (on 1.5x) and wait, believing that the pace would pick up and everything would come together more elegantly in the second. Instead, the second part of the book sounded as if it had been cut and pasted out of some ridiculous 50's maritime jungle island adventure book. A it was just that--ridiculous. As soon as they got of the ship, I don't know how many times I rolled my eyes or wondered when something was actually going to happen. Predictable and/or flat plot 'twists' galore are dragged out for no reason other than to take up another full book so that three can be sold instead of one or two. It seems like Sullivan wasn't sure where he was going with the story and just wrote in a lot of filler for fun. (Hmm...I've gotten my fun with the dragon-fighting adventure, ticked off the generic sea adventure gun battle part...now let's put Royce and Hadrian on a jungle trek with typical challenges and lots of shifty 'savages'! Wouldn't that be fun?) No. The characters are really the only compelling aspect of this rather flat book. 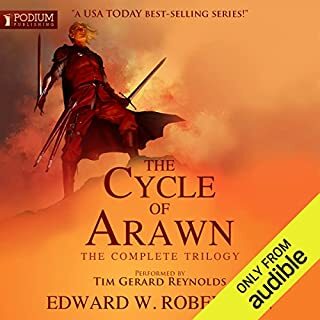 If not for my affection for a few of them (namely Hadrian and Arista), I would have zero motivation to find out what happens in the third installment. I'm still not sure I care enough to find out after this disappointingly typical middle book. Just like the first book, this is two novels in a single volume, and my opinion stands that it is an enjoyable adventure story. 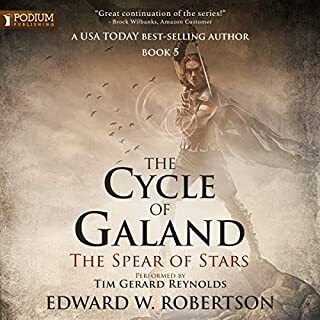 The two protagonists Hadrian and Royce have only gotten better as the books have gone on. 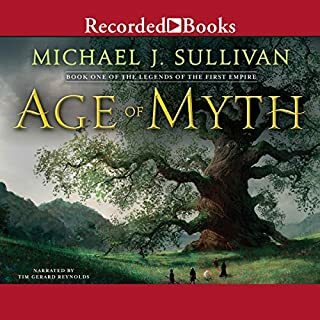 With this type of the book, Sullivan could easily have gotten away with making them flat and standard characters, and I would have been more than happy. So imagine my surprise and glee when they turn out to have depth and purpose. Something great about Riyria Revelations is that each book isn't a new paint job on the previous. 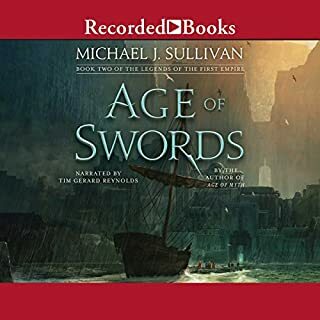 The first book was an adventure romp, the second was a little town under attack, the third a besieged city, and the fourth a high sea adventure. Sounds pretty exciting eh? With each consecutive book, the story has grown and developed. I would be remiss to not admit I am a little disappointed in the book leaving its shallow relaxing origin to be something of more depth and meaning. Not a bad thing, good for most in fact. Though since the humor and laugh out loud moments have stuck around, I'm good, and have in fact already begun the third volume. One thing that drives me up the wall in irritation is when a book constantly changes perspectives, resulting in numerous stories going on in a single book. This book has, I'd say three of these, but they didn't bother me. In fact I barely noticed them. There were the occasional "son of a gun" moments as the perspective switched at a cliffhanger point, but then I got treated to another storyline that I was missing. I liked all three, believe it or not. This series and author are great since he doesn't bother with the boring parts. Yes those boring parts build up the story and suspense, but hey, as Sullivan proves, if you have just the good parts, you can do the same. 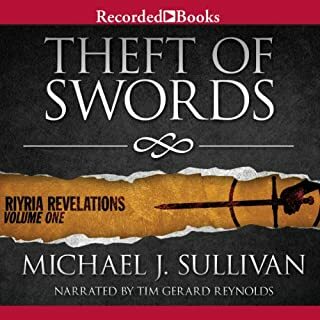 So, if you read the first book, Theft of Swords, then read on, it only gets better. 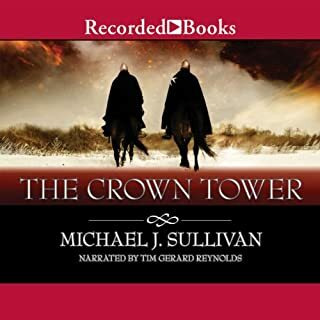 Great series not only a well written book but complimented by a great narrator in Tim Reynolds. 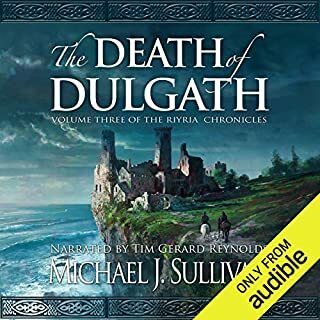 After reading the second Riyria book, I am starting to understand some of the good reviews for the series. 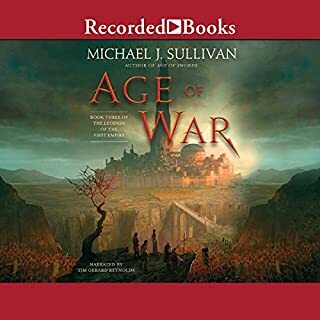 While the first two books were more single stories within the same setting, with Rise Of Empire, author Sullivan begins to expand the story beyond the exploits of Royce and Hadrian, and with this, the series begins to become a new and much more enjoyable experience. 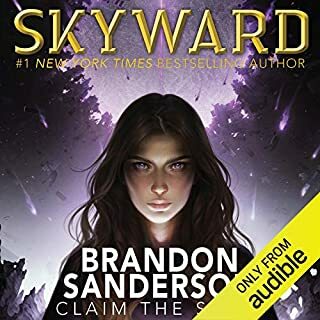 Characters from the first two books take on expanded roles, and new characters form to provide the listener with a larger epic fantasy type world. I really enjoyed the larger roles for the women, Arista, Thrice/Modena, and new character Amelia. Their additions opened up what was an average story to something much more grand. 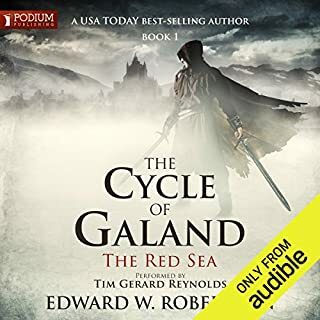 The narrator Tim Gerard Reynolds continues to be solid, and I think his voices are growing on me despite some of characters sounding the same. Overall, I am enjoying this series very much, and have already moved on to the next book in the series.